To help you with your search, browse the 1 review below for assisted living facilities in Sullivan. On average, consumers rate assisted living in Sullivan 5.0 out of 5 stars. Caring.com has helped thousands of families find high-quality senior care. To speak with one of our Family Advisors about assisted living options and costs in Sullivan, call (855) 863-8283. Sullivan is the county seat and largest city of Central Illinois' Moultrie County, where Abraham Lincoln practiced law in the mid-1800s before he debated Stephen Douglas. The town had only 528 residents, according to the 1860 Census figures, but it's home to 4,440 people as of the 2010 Census, including 890 who are age 65 or older. Some of them may need help with their activities of daily living. To accommodate this demographic, Sullivan has two assisted living facilities (ALFs). Like all ALFs in Sullivan and throughout the Prairie State, the Illinois Department of Public Health monitors such residences serving three or more unrelated adults. Illinois exempts most retirement income from taxation, including pensions, Social Security payments and income from retirement accounts. However, the state has high property and sales taxes, which could affect the amount of money Sullivan seniors have for an ALF. The cost of living in Sullivan, at 76 on a scale with 100 as the national median, is 24 percent less than state and U.S. averages, with housing costs around half the national average. However, seniors may pay more for healthcare here. Sullivan gets just 13 inches of snow, which is 50 percent lower than the U.S. average. Winters are cold, and summers are hot with lows of 19 degrees and highs in the mid-80s. These temperatures may be uncomfortable for family members relocating to be closer to senior loved ones. The rate of violent crime in Sullivan is 50.0, much higher than the U.S. average of 31.1 and the state average of 32.1. Sullivan's property crime rate is also high at 45.9, with the national and Illinois averages at 38.1 and 27.5, respectively. While touring local ALFs, seniors may wish to ask about security measures in place to safeguard residents. Air quality is good in Sullivan with a 68 score on the EPA's National Air Toxics Assessment compared to the U.S. average of 58. Seniors with COPD, asthma and other respiratory ailments may breathe a bit easier here than in cities of similar size across the nation. Sullivan has no medical centers in the event of a medical emergency or illness, with the nearest major hospital, the Sarah Bush Lincoln Health Center, located in Mantoon, 19 miles away. Assisted Living costs in Sullivan start around $0 per month on average, while the nationwide average cost of assisted living is $4,000 per month, according to the latest figures from Genworth’s Cost of Care Survey. It’s important to note that assisted living rates in Sullivan and the surrounding suburbs can vary widely based on factors such as location, the level of care needed, apartment size and the types of amenities offered at each community. 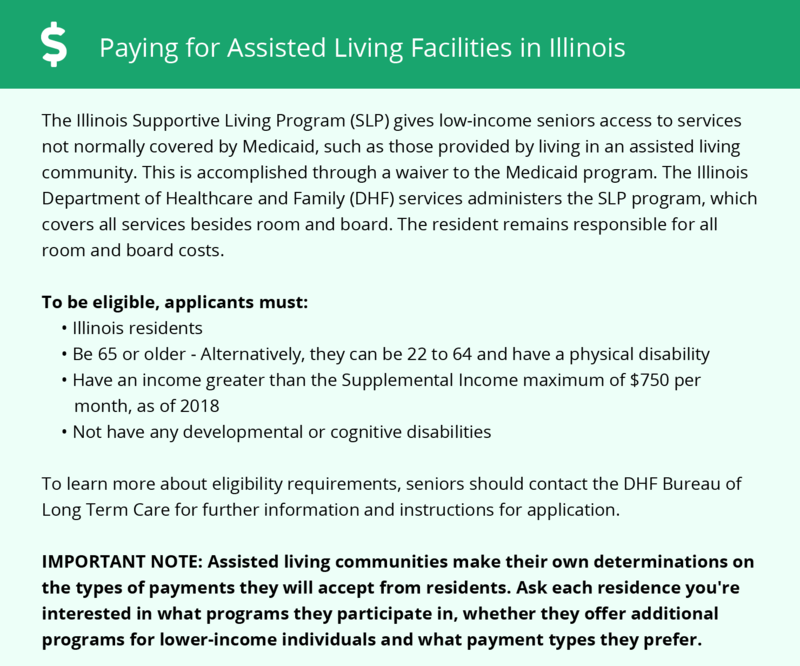 In Sullivan and the rest of Illinois, one Home and Community Based Waiver, called the Supportive Living Waiver, pays for assisted living services for eligible residents in supportive living facilities. Sullivan and the surrounding area are home to numerous government agencies and non-profit organizations offering help for seniors searching for or currently residing in an assisted living community. These organizations can also provide assistance in a number of other eldercare services such as geriatric care management, elder law advice, estate planning, finding home care and health and wellness programs. To see a list of free assisted living resources in Sullivan, please visit our Assisted Living in Illinois page. Sullivan-area assisted living communities must adhere to the comprehensive set of state laws and regulations that all assisted living communities in Illinois are required to follow. Visit our Assisted Living in Illinois page for more information about these laws.